Well PhraseExpress is a free tool that blew me away! It organized my commonly used phrases (some pretty long); expanded abbreviations (as I typed); auto-completed phrases (just like MS Word’s Auto Correct feature); and corrected spelling (MS Word does this already, but this will do it in any program – like when I mis-spell a word in my Facebook status). And did I mention the price, FREE! (Disclaimer: it is only free for personal use). This has made partnership development faster and easier. (Note: I did not say that it made it fast and easy, I just said this makes it faster and easier). Anyone who corresponds several times each week (or daily) should have this utility. Three features that I especially found neat in PhraseExpress were: 1) I set Phrase express to enter my email address when I press Ctrl-F12. 2) I like to close my letters and e-mail with a thought-provoking / inspirational quote. I set up a directory of “famous quotes”; then a sub-directory of my favorite authors (i.e. Augustine, C S Lewis; A W Tozer; Schafer; Chesterton; etc.). 3) I save my data file to “My DropBox.” That way any updates I make are available to me on any computer that I use (with DropBox installed). Product support can be summed up in three steps: 1) make sure you are running the latest version, 2) read the manual and 3) browse the support forum. The product is Windows product that works with 32 or 64 bit Windows XP, Vista and 7. A USB memory device version is available too. I am still looking for a program that will write my letters for me, but in the meantime this is a piece of software that saves me time and keyboarding. If you would like to know more or download your personal FREE copy, check out the PhraseExpress website. Ken works with Wycliffe Bible Translators as a Network Administrator. Currently he and his family are raising support to serve the Lord on the foreign field. Ken will serve Bible translators by helping to keep their computer systems and Internet connections operational. Being a Linux user, I was pleasantly surprised to see there is a similar product for my operating system. It is called AutoKey. It is not as feature rich as PhraseExpress but it seems to be very capable of basic text expansion and macro creation. I have not used it enough to be used to it yet, but I look forward to learning how AutoKey can be used to save time. Thanks Ken for sharing this tool and giving me a reason to find a similar tool for Linux! 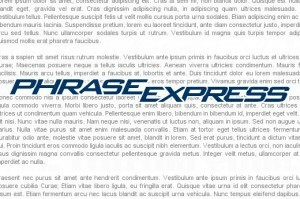 I use PhraseExpress for a long time and confirm that it is a great time saver. If you move the data file to dropbox, how do you tell the PhraseExpress program to look for it there? Mike, I have not used PhraseExpress personally since I am a Linux user, but until Ken pops in with a possible suggestion, let me point you to this section in the PhraseExpress user manual. It is about the data file location. If you read down a little bit it talks about saving the file to an alternate location. Maybe that will help answer your question. PhraseExpress remembers the last location and will open that files the next time you open PhraseExpress. David, thanks the manual is always a great resource.